Lourdes was first published in 1894. 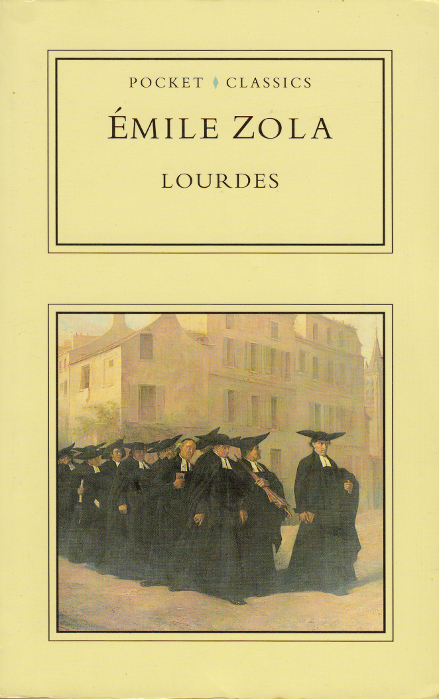 Zola first conceived of the book when he visited Lourdes in September 1891 and was taken aback by the number of pilgrims that visited the shrine to the Virgin Mary. He returned the following year during August, which is the busiest period for pilgrimages, and in Zola’s typical fashion he spent time with the pilgrims, carrying out interviews and observations to form the basis of this book. The book is set over a five-day period starting on Friday 19th August, with each day covering approximately a hundred pages each. The main characters are the Abbé Pierre Froment and his childhood sweetheart Marie de Guersaint, who has been paralysed since the age of thirteen when she fell from a horse. Day one covers the trip by train from Paris to Lourdes and we are introduced to a whole host of characters mostly made up of those pilgrims who have a variety of ailments and who are hoping for a miracle cure at Lourdes. Pierre’s and Marie’s story is revealed early on in the novel and it is noted that Pierre has lost his faith. Marie is aware that Pierre has lost his faith but she is optimistic that she will be cured at Lourdes and that such a miracle may help Pierre believe again. So, if Pierre has lost his faith, why doesn’t he leave the priesthood? He reasons that he is permanently marked as different than other men and that having kept his vow of chastity he should be able to conquer his mind as well. As for Marie’s illness, the doctors are not agreed on the cause of it and are unable to cure her, indeed one young doctor suggests that it is psychosomatic and that a cure at Lourdes may be possible if she believes in it herself. He even predicted how the miracle would come about; it would be like a lightning stroke, an awakening, an exaltation of the entire being, whilst the evil, that horrid, diabolical weight which stifled the poor girl would once more ascend and fly away as though emerging by her mouth. When the pilgrims arrive the next day they settle in to their accommodation and eagerly wait for their visit to the Grotto at Lourdes. Pierre meets an old friend Dr. Chassaigne, whose story mirrors Pierre’s, in that he has lost his ‘faith’ in medicine following the deaths of his wife and daughter; his own inability to save either has crushed his spirit and his only hope is for God to re-unite them with his death. …the water was scarcely inviting; for, through fear lest the output of the source should not suffice, the Fathers of the Grotto only allowed the water of the baths to be changed twice a day. And nearly a hundred patients being dipped in the same water, it can be imagined what a terrible soup the latter at last became. All manner of things were found in it, so that it was like a frightful consommé of all ailments, a field of cultivation for every kind of poisonous germ, a quintessence of the most dreaded contagious diseases; the miraculous feature of it all being that men should emerge alive from their immersion in such filth. Meanwhile Marie visits the Grotto and prays to the Virgin Mary to be cured. Over the next couple of days Pierre visits the Verification Office, where all claims of miracles are assessed by a team of doctors, visits some of the local shops that sell all sorts of souvenirs, accompanies Marie’s father to a communal eating establishment run by some nuns and visits a local barber who rants constantly against the ‘new’ Lourdes that has appeared since the pilgrimages, despite making money by taking in lodgers. The crowd cheer and applaud her, she sobs, and walks, Pierre sobs as well. After all the jubilation Marie ends up at the Verification Office and after much debate it is declared a miracle; only Pierre, who knows the true nature of her illness, is sceptical. And so the last day consists of the return trip; Pierre and Marie have to decide what they want to do with their lives. Will it be together or will they stay apart? The book is split into five chapters, one for each day, and then each chapter is split into five sections as well. The last section of each chapter recounts the story of Bernadette Soubirous who is the girl to whom the Virgin Mary appeared to eighteen times in 1858 and is the source of the fame of Lourdes as a holy site. Theses sections are interesting enough and give some important background information to the reader. Zola is brilliant at crowd scenes and one is included here, where a whole chapter is devoted to a night procession. There are also some funny episodes and some analysis of the Lourdes phenomena from an outsider’s perspective; but I must admit I had problems reading Lourdes, it proceeds at such a slow plodding pace that it was quite tedious to read at times. It felt so static and the structure of the novel was too restrictive, especially where two of the five chapters are taken up with the train journey to and from Lourdes. At times it felt more like a piece of journalism than a novel and may have been better if it had been written up as an article. Unlike Zola’s previous novels where his extensive research added to the stories, here it just bogged it down in too much detail as he tried to cram everything in. The other criticism is that there is no tension to the story; we know Pierre has lost his faith, we’re pretty sure that Marie will be cured and because Pierre accepts that her illness is psychosomatic he is unlikely to consider her ‘cure’ a miracle and therefore it is not likely to help him regain his faith. Even the multitude of characters is a bit repetitive as they’re all defined by their illnesses. Why then isn’t Lourdes read today? With its potentially explosive ingredients, it should be ticking away like a time bomb, even after all these years. The trouble is that despite the proliferation of characters, the swirling, nervous crowds and the fascinating conflict between the sacred and secular activities, the narrative has lead boots, with one foot anchored firmly in a single location, Lourdes, and the other, equally immobile, in Pierre Fromant’s mind. It is a little like being confined to a dreary little holiday hotel for days on end because of bad weather; even though we are in the company of a raconteur who desperately tries to entertain us, it isn’t what we came for. Although I had a physical copy of the novel (the one pictured) I ended up reading most of it on my kindle, partly because of the ease but also because the print was so small in the book. Both were versions of the Vizetelly translation which can be found at Project Gutenberg. The translation is a bit old-fashioned and stuffy and the book could do with a more modern translation but it was still quite readable and I don’t think it would have been bowldlerised that much, if at all. Despite the faults with Lourdes I shall continue with the others…next stop Rome. This was cross-posted on my blog Intermittencies of the Mind. 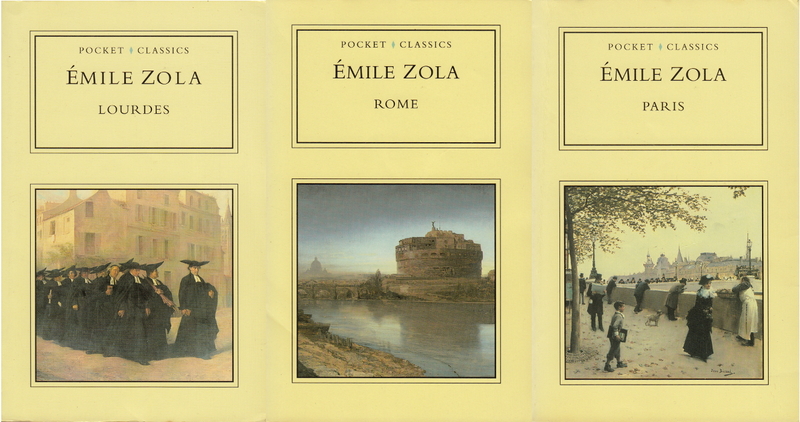 This entry was posted in 1894, Émile Zola, Jonathan (Intermittencies of the Mind), Vizetelly, Ernest A and tagged Émile Zola, Lourdes, Three Cities, zola. Interesting how tastes vary, Jonathan. I liked Lourdes more than you, so we’ll see how the others fare. Rome was actually my least favorite. It had some good parts, but a bit too much politicking for me. It’s been a long time since I read them, but I think Paris might have been my favorite. I thought it would have been better to have concentrated more on Pierre’s & Marie’s internal life and to ditch some of the extras. Also to ditch days 1 & 5, or make smaller, and concentrate on the actual time at Lourdes. I’m hoping to start Rome next month. I also would have liked more Pierre and Marie.